Two professional Aussie cricketers sporting an insatiable love of coffee start their own coffee pod company. Boom. It’s true, meet Tripod Coffee. Cricketers Steve Cazzulino and Ed Cowan were perpetually on the road playing state cricket, and brought along a Nespresso machine with them for much-needed cups of coffee in the morning before matches. Seeking a local, sustainable alternative to the George Clooney-fronted pod giant proved difficult, so the pair saw a glimmering niche in the coffee-obsessed Aussie market. Steve and Ed decided to create their own small company making pods filled with high-quality coffee that fit perfectly in the Nespresso machine. “On a rainy day we thought, why don’t we have a crack and take on the big boys?” says Ed. “We could fill the capsules with coffee that we really enjoy drinking”. With Steve and Ed touting a pretty gutsy attitude to take on the pod monopoly, they cooked up a bit of clever naming (‘tri’ for their three foundation coffee blends and ‘pod’) and Tripod Coffee was born. After their coffee has been ethically sourced, it’s given the special treatment by a local award-winning roaster, packed and shipped. During the process, all oxygen is vacuumed from the pod so when you pop it in your machine, it’ll be like it was freshly ground. The best bit? The capsules are recyclable. Sustainable, local coffee — yep, that’s music to our ears. Ed and Steve started the business in order to provide a green alternative to the aluminium pods of Nespresso. Ed and Steve’s sense of humour comes through the product names, using of different hats for different blends and strengths — Grey Gaucho, Red Fedora, Blue Beret, Black Panama, Gold Sombrero. 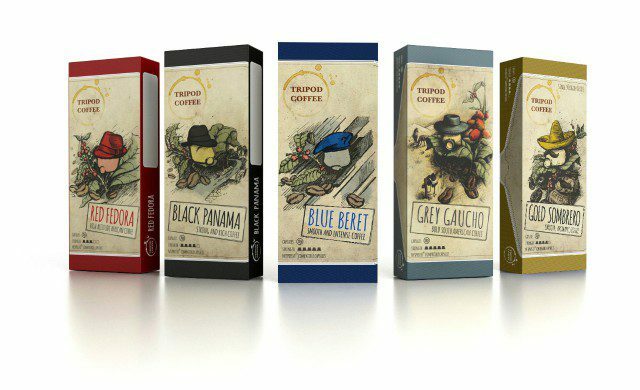 Aside from their mainstays, like the Red Fedora which works as a great citrus-y espresso, they’re keen to run special edition capsules and expand their single origin series. Yes, with Tripod Coffee, single origin Panamanian might be coming to your Nespresso machine soon.